His model has been criticized by other scientists and old earth creationists such as Hugh Ross and Samuel R. Conner. On Humphreys' thousands-of-years-old universe, in 1998 physicist Dave Thomas wrote that Humphreys "has his astronomy backwards - the Kuiper Belt contains the remains of the "volatile" (icy) planetesimals that were left over from the formation of the solar system - numbering in the hundreds of millions. If anything, it is the Kuiper Belt that supplies the more remote Oort Cloud, as some icy chunks are occasionally flung far away by interactions with large planets." 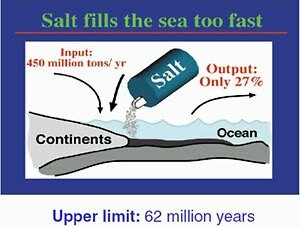 Thomas also criticised Humphreys' idea that there is "not enough sodium in the sea" for a several billion year old sea, writing, "Humphreys finds estimates of oceanic salt accumulation and deposition that provide him the data to "set" an upper limit of 62 million years. But modern geologists do not use erratic processes like these for clocks. It's like someone noticing that (A) it's snowing at an inch per hour, (B) the snow outside is four feet deep, and then concluding that (C) the Earth is just 48 hours, or two days, in age. Snowfall is erratic; some snow can melt; and so on. The Earth is older than two days, so there must be a flaw with the "snow" dating method, just as there is with the "salt" method." Geologist Kevin Henke has criticised Humphreys for stating that "zircons from the Fenton Hill rock cores... contain too much radiogenic helium to be billions of years old." Henke wrote that the equations in Humphreys' work "are based on many false assumptions (isotropic diffusion, constant temperatures over time, etc.) and the vast majority of Humphreys et al. 's critical a, b, and Q/Q0 values that are used in these 'dating' equations are either missing, poorly defined, improperly measured or inaccurate." Scientists Glenn Morton and George L Murphy have dismissed Humphreys' cooling model as "wrong" because "it is ineffective, it is falsified by observational data, and it is theologically flawed." First, in a classical model for a harmonic oscillator (like a particle oscillating in a crystal), "the particle does not lose energy to the cosmic expansion." Second, Humphreys' model "is too slow to be useful to the creationist agenda." Thirdly, "there would be visible effects in the spectra of light emitted during the Flood, including those from stars a few thousand light years away in our own galaxy. A change in the energy levels of atoms (which this idea would entail) would change the frequencies at which light is emitted in a fashion that would be observable. The lack of such observations rules out Humphreys' cooling mechanism as a reasonable possibility." Lastly, they criticized it for contradicting the theological foundation Humphreys uses in another publication. E normal ca intre oamenii de stiinta sa existe contre vis-a-vis de teoriile lor. In special cand ele se bat cap in cap. Treaba noastra este sa le cercetam si sa vedem care este mai plauzibila, deoarece amandoua sunt teorii. Nici Morton si nici Humphrey nu pot recrea conditiile originale. Daca ne uitam, ca exemplu, la stirea anuntata de Dr Venter - viata creata in eprubeta - un alt anti-creationist (Steve Jones) a spus ca este pur si simplu o tampenie. Sunt de aceeasi parte a baricadei si tot se contrazic. Ce sa mai spunem despre oameni aflati de o parte si de alta?